President Kevin J Worthen announced a new “Inspiring Learning” priority at BYU—an emphasis on experiential learning. We searched high and low for examples of this kind of learning taking place already at BYU. The following is one of eight. Find the full feature here. It was a weekday morning in Provo, and Alena C. Helzer’s (’17) roommates were still asleep. While lounging in her pajamas, she got a phone call—from Germany. 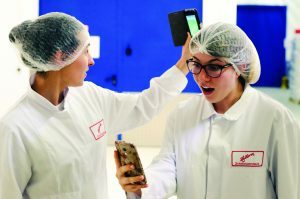 “I want you to pitch your idea to our board of directors,” said Darren R. Ehlert (BS ’98), her former boss at the internship she’d just concluded with the Halloren chocolate factory. “Can we have a conference call in 15 minutes?” They had discussed the idea of promoting the company through microblogging. Now he wanted her to present that idea to the board of directors. From Provo. In German. In just 15 minutes. Alena Helzer (right). Photo courtesy Alena Helzer. During the summer term, armed with her mission German and excited to be mentored by Ehlert, a BYU grad, Helzer had interned in Ascheberg, Germany. Though she had no previous marketing experience, while at Halloren, Helzer developed new packaging for North American markets, worked with retailers like Costco to promote the brand, created content for social media, and even helped develop branding for a new product, Snickerdoodle Bites. Working directly with “the bosses,” Helzer says the mentoring she received helped her not only gain admittance to BYU’s Marriott School but also grow personally and professionally. And it led to a part-time job after she returned to school. Thanks to her pajama-clad conference call, she now works with 300 bloggers across the United States to promote Halloren products. Find the full story on President Worthen’s “Inspiring Learning” priority here. After an injury forced her to let go of music, Hannah Lambert found a new passion: digging into history, literally. A PhD student's research took her to Antarctica. . . to study Antarctic nematode worms. Student Adam Larsen is building a real algorithm for a real company with a real problem to be solved.